In this wrap carrier the infant appears to be in the cradle position. The infant is not touching the mother's chest and therefore not hearing and feeling the mother's heartbeat for added comfort. 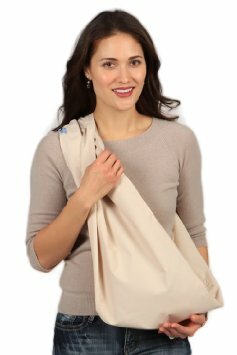 It also does not appear to accommodate breastfeeding while using this wrap carrier. In my opinion this particular baby wrap carries the baby much too loosely. Come back again next Friday for another Baby Carrier Friday. Your comments welcome. I hope you enjoyed my personal review of this baby carrier. If you are looking to find a baby carrier, it would be appreciated if you would check out my store (just click on the word "store" above). Thank you for visiting my blog and hopefully visiting my store.